Having given up on a more threatening approach after 15 minutes against a Nigeria team that never looked dangerous, there wasn’t much hope of entertainment from Iran for this game. Argentina would either score early on and pull them apart or they would struggle to break them down and the game would be a slow and turgid affair. Alejandro Sabella changed to the 4-3-1-2 that had brought success in the second half of the win over Bosnia & Herzegovina, bringing in Gonzalo Higuain and Fernando Gago for Hugo Campagnaro and Maxi Rodriguez. Carlos Queiroz changed to a 4-5-1, moving Ashkan Dejagah to the left and Masoud Shojaei replacing Khosro Heydari on the opposite flank. The first half went as expected: Iran defended deep and narrow with all eleven players retreating far into their own half. It was up to Argentina to break them down and they only really offered any attacking threat from a handful of set-pieces. Argentina couldn’t work it through the middle, so they were relying on Marcos Rojo and Pablo Zabaleta to stretch play, with the former doing the better job but still not offering enough. The Iranians became much braver in the second half however. 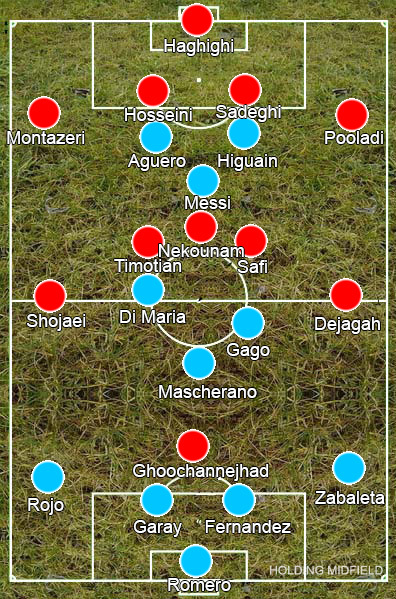 Argentina had to commit their full-backs forward if they were to break down Iran, so Iran broke quickly into that space down the wings behind them, having the far better of the second half. Sabella replaced out and out strikers Higuain and Aguero with the more versatile Ezequiel Lavezzi and Rodrigo Lavezzi, who were more likely to buzz around and create something rather than staying static, yet it was again left to Lionel Messi to prove his worth. With every man back, Iran will feel they should have done better for his goal. They gave him just one second too many over 90 minutes and were still punished for it. Without playing well in either game, Messi is somehow managing to cement his place as the best player in the world at this tournament. Iran might have won a few hearts having come out of their shell in the second half, but, as such a horrifically dull side normally, it’s probably for the best that they don’t make it out of the group.